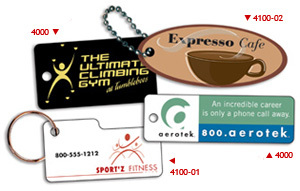 Key Tags are great for loyalty programs and member identification. They can be printed in the rectangular shape (#4000), oval shape (#4100-02) or swipe shape (#4100-01). Please contact Plastic Works to discuss other options available.